Author: A. Catharine Ross PhD, Benjamin Caballero MD PhD, Robert J. Cousins PhD, Katherine L. Tucker Ph.D., Thomas R. Ziegler M.D. Acknowledged author A. Catharine Ross PhD wrote Modern Nutrition in Health and Disease (Modern Nutrition in Health & Disease (Shils)) comprising 1648 pages back in 2012. Textbook and etextbook are published under ISBN 1605474614 and 9781605474618. 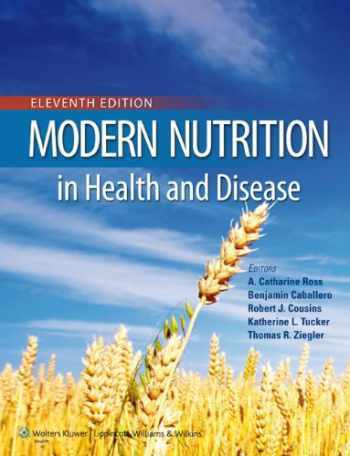 Since then Modern Nutrition in Health and Disease (Modern Nutrition in Health & Disease (Shils)) textbook received total rating of 3.5 stars and was available to sell back to BooksRun online for the top buyback price of $44.61 or rent at the marketplace. This widely acclaimed book is a complete, authoritative reference on nutrition and its role in contemporary medicine, dietetics, nursing, public health, and public policy. Distinguished international experts provide in-depth information on historical landmarks in nutrition, specific dietary components, nutrition in integrated biologic systems, nutritional assessment through the life cycle, nutrition in various clinical disorders, and public health and policy issues.Modern Nutrition in Health and Disease , 11th Edition, offers coverage of nutrition's role in disease prevention, international nutrition issues, public health concerns, the role of obesity in a variety of chronic illnesses, genetics as it applies to nutrition, and areas of major scientific progress relating nutrition to disease.